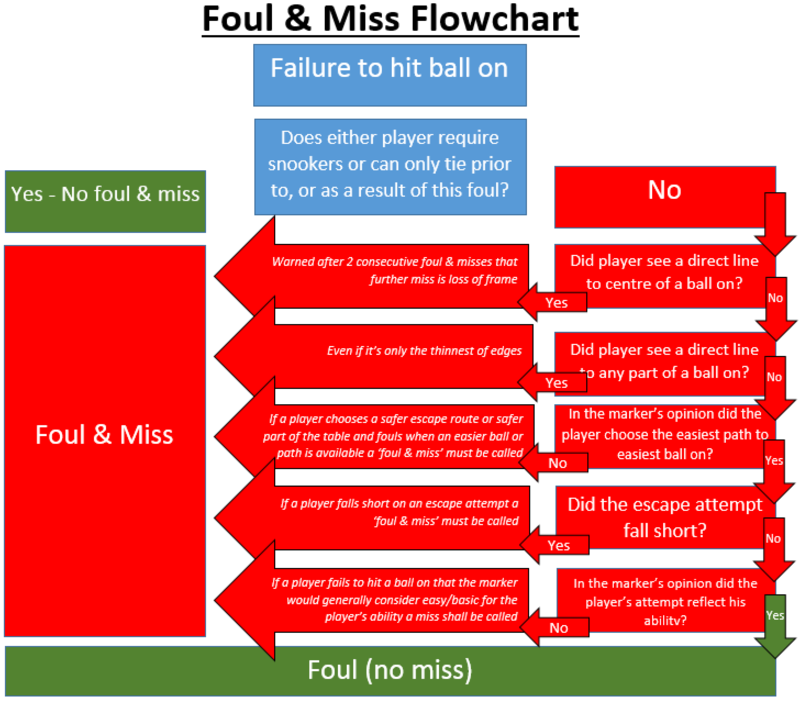 The ‘Foul and a Miss Rule’ is part of the rules and thus should be played by all players. The ‘Miss Rule’ has always had much controversy surrounding it. Here are some guidelines to help you understand it. This rule does not apply if either player requires snookers before or as a result of the foul committed, unless the striker has obviously made no attempt to hit a ball on. The striker can hit any part of any ball on without having to use side, swerve, or a cushion. The striker has not hit the cue ball with sufficient strength to reach a ball ‘on’. The striker has not given the shot sufficient thought. The striker, in attempting to swerve or just miss an intervening ball, hits a ball not on directly. The striker has made a ‘poor attempt’ at escaping from a snooker – a ‘poor attempt’ takes a players ability into account and the difficulty of the snooker. When the striker can directly hit the centre of a ball on (i.e. without having to hit a cushion first), and fails to do so on 2 consecutive attempts at the same shot, he/she shall be warned by the referee that a third miss will result in the frame being awarded to their opponent. Any other fouls, such as moving a ball by hand, shall not disturb this sequence of misses. When another red prevents centre ball contact with a red, this will count as centre ball contact. In the interest of consistent application of the rule the marker can explain his or her reasoning for calling or not calling a miss. Players can question a marker but will abide by markers decision once made.